Whether you have given up in the past and gone back to smoking or smoked solidly since you were a teen, the fact you are reading this now suggests you have reached the point where you have decided to honour yourself and make a positive change; to free yourself of those smoky shackles. 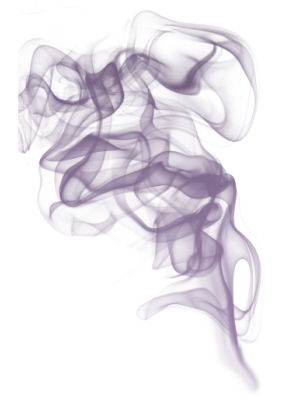 By understanding the reasons people continue to smoke, albeit consciously or subconsciously, their specific triggers and what it is the cigarettes are providing for them, the therapist is able to utilise the beliefs of the client and help them to create new more empowering beliefs about themselves and who they are and releasing them from the identity of being a smoker by creating a new identity for them as a non-smoker, removing any cravings and allowing them to enjoy a life that is healthier, more fulfilling and ultimately smoke free. Most people can be helped in one session and with the right mind-set will continue to be smoke free after just one session. Our Smoking Cessation Package comes with a FREE follow up session for anyone who needs to tweak or boost the work done in the first session, this may be because they were unaware how much they were relying on cigarettes and may have forgotten to mention some triggers that need to be added in or because they are not fully committed to being smoke free and there is a tiny part that is not ready to let go and move forward. The follow up session allows for any of these issues to be address quicly to increase the chances of success. People who look forward to being smoke free are more successful than those who are giving up because they feel they should or because someone else has asked them too, look at your reasons for wanting to be a non-smoker and check they are in line with your values and beliefs. Think about what your triggers are and consider the alternatives; e.g. when you’re feeling stressed, 5-10 minutes of deep breathing exercises to calm the mind and allow you to think clearly, empowering you to remain calm and in control. Consciously notice the benefits of not smoking, for example, the money you will save, being free from the smell of smoke, the return of your sense of smell and taste and all the amazing health benefits you will receive. 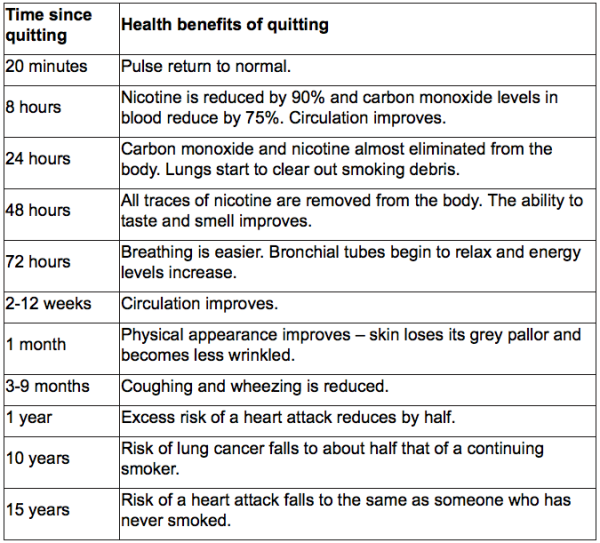 Some of the health benefits from stopping smoking can occur quite quickly as the table below shows. Other health improvements are seen over the course of a number of years, depending on how long a person has smoked. As you can see, regardless of how addictive you believe nicotine to be, within 48hrs all traces of nicotine are eliminated from the body and the system is nicotine free, this in itself dispels the idea that the body is dependant on nicotine to survive. By using hypnotherapy to then create new behaviours, when it comes to triggers and habits, the client can decide which new ways they would like to react and respond to situations where previously they may have turned to a cigarette. Having a new way of responding or reacting to situations that will enhance their wellbeing and create more positive choices in the future also gives the client back the power and control over their health and wellbeing, empowering them to continue on the healthier less restricted path of a non-smoker.